Sharjah is the third largest Emirate of the UAE and the only one to have land on the Gulf of Oman and the Persian Gulf. This constitutional monarchy is spread over an area of 2600 sq. km, and attracts over 5 million investors and tourists annually. Strategically located between Africa, Europe and Asia, Sharjah boasts of a low crime-rate and a fair judicial system. This liberal economy is also one of the world’s safest cities with free trade zones that have been set up to boost local economy and drive foreign investment. Sharjah has forged excellent trade relationships with more than 125 global countries, which contributes largely towards domestic trade. Three seaports and free zones in Sharjah also play a major role in empowering the economy of the region. Sharjah has Competitive real-estate prices, and property & management leases. 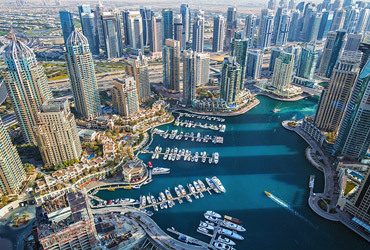 The emirate has world-class ports and an international airport. Sharjah has presence of over 40 international banks. There is abundant and low-cost supply of energy. Sharjah is easily accessible via land, sea and air routes, another factor bolstering trade in the emirate. There are no foreign exchange controls, quotas or trade barriers in Sharjah. Prepare the Memorandum of Association (MOA) of the company, and get it notarized in a public notary. Complete the licensing requirements and pay the licence fees to get a trade licence for your company. Decide upon a name for the company, and submit it to the Name Board.